Joe and I have seen these beautiful bamboo shades at Hotel San Jacinto. I would love to find someone to make these beauties for us. 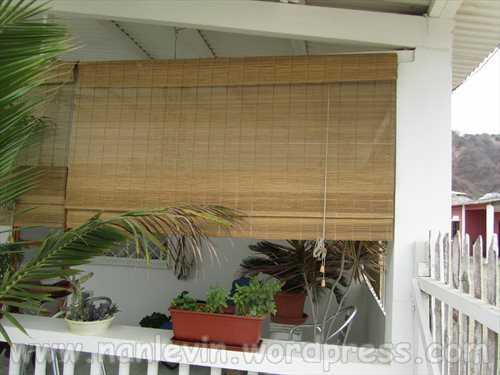 We ended up purchasing other bamboo shades (photo below) for our porch, they are nice but would prefer to have the above heavy-duty ones. Between the sun, sand and wind the pull cords on one of them has already frayed. Anyone knowing where to buy these heavy-duty shades let me know, we are in the market. 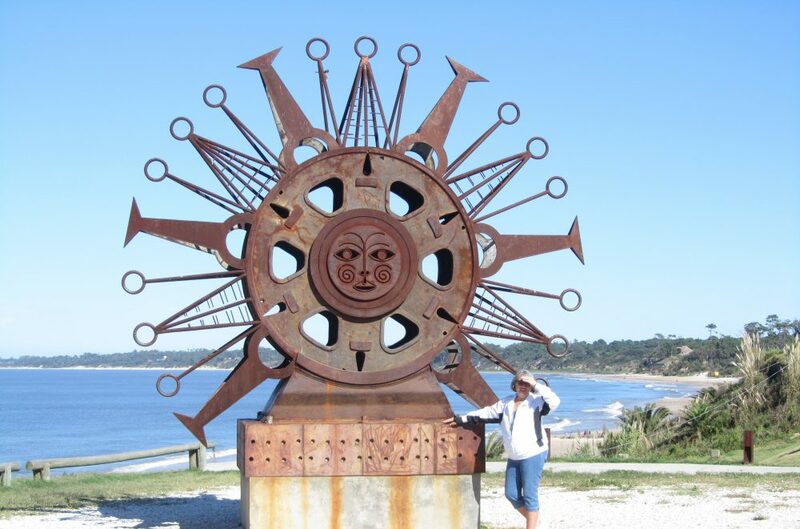 This entry was posted in Bamboo Shades, Ecuador, San Clemente, San Jacinto and tagged Bamboo, bamboo shades, Beach living, Ecuador, Expats, San Clemente, San Jacinto, South American, Window blind by Nancy Levin. Bookmark the permalink. Yes they do we bought some for a home we rented in Montanita. 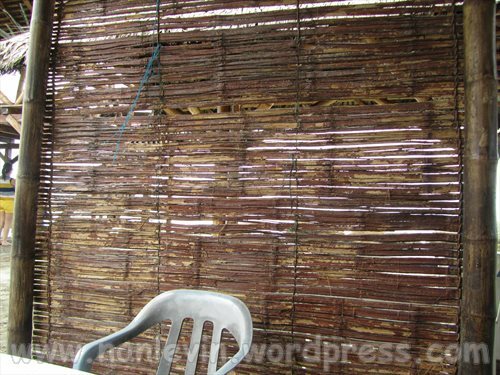 Amiga, you can buy those flat sections of split bambo/canya on the edge of charapoto… the lumberyard always has several bundles of palm thatch (cade) stacked at the entrance by the highway. from your photo, it looks like those sections are linked together, and i’m betting there’s someone nearby who can make that for you if you buy the pre-split canya. the people that sell the canya in charapoto might know who can help you! I am a Returned Peace Corps Volunteer ( Gambia 1970-71 )looking to connect with any current or past PC Volunteers who served in either Ecuador, Honduras, Belize or The Gambia from any time period. I will be travelling to Ecuador on Feb. 7, 2014 for two weeks and wish to learn about current sustainability projects there ( or in any of the above-mentioned countries ) that are looking for volunteers and’or are willing to pay me some wages.. I may travel to Honduras or Belize next year and The Gambia within a few years as well. .
Of course, anyone who has information about my request is welcome to respond. Thanks for your help! Are you a RPCV? I’m looking to get something like these for my house too, but first i have to check on the price as it may be a little expensive. Yes, my house is finished now (minus the dining room table), there are some pictures on facebook. I bet you could find someone to make those bamboo shades as your friend recommended. bamboo, twine, a machete, some pulleys, a cleat to tie it off on when raised, a few pilsners and you are all set! If re-stringing an existing shade, use nylon cord. Do not use cotton as it will fray out again. After the shade is restrung, pull the shade to its highest position and use a small piece of soap to wax the cord. This will help it slide thru the channel and also prevent rust to the metal catch and release mechanism. I can buy spooled, nylon twine available in garden sections of home improvement stores. Have much the same type of weather here in Oregon – lots of rain. I just came across your blog through some posting you did today. I find it very interesting and reading along I found your interest to get maybe some muyuyo fences or shades. I know a guy who is so good in making lamps, chairs, windows, mirrors, anything you ask. He lives in San Antonio, close to Manglaralto. His name is Silvino and his number is 0985448493. I wish I can help him and his beautiful skills more.